Its 3.30pm and Daham Basha, the border control officer, is clocking off. He jumps into the car with me because his home town Rîmelan, is on the way to Amuda where I am to be hosted by the Media Centre. The rolling countryside is dotted with oil wells, one reason why Rojava may prove to be self-sustaining and why both Assad and ISIS might want to get their grubby hands on it. There are no hoardings, no malls, no motorways, no signs of capitalist excess, only largescale pictures of the ‘martyrs’ who have sacrificed their lives for the revolution usually erected by checkpoints situated on entry to and departure from every town and village. It could not be more different from Iraqi Kurdistan (Kurdish Regional Government). Karawan, Daham’s boss, by contrast, never clocks off. He has dedicated his life to ‘ the service of the people’, never got married, sleeps, eats, and breathes the air of the Border offices, working till midnight if necessary. His military training was acquired in the Turkish mountains fighting with the PKK (Kurdistan Workers’ Party) which points to the overlapping histories of the Turkish and Syrian Kurds and will become clearer as my journey continues. When the revolution took place in Syria, these fighters came back to protect it. These fighters included large numbers of women, one of whom, Hediye Yusuf, the Co-President of Cizire Canton, the biggest region of Rojava (now co-president of the Democratic Federation in Rojava and North Syria which was declared on 16 March 2016), I was lucky enough to meet and interview. Yusuf crams us into an already busy day. We meet her in the morning when she attends the inauguration of the grand new building of Weqfa Jina, the Foundation of the Free Woman of Rojava, at which point she could only give us 45 minutes. So she agrees to see us at her home in Rîmelan, that night, which is a two hour drive away. The humility and accessibility of people high up in the administration is an aspect of this egalitarian society which never fails to surprise me. Her ‘home’ is apparently in a grand mansion in a complex of such buildings which have been turned into academies. This complex had been owned by the Assad government and was simply taken over by the Rojava administration. From a capitalist point of view, the mansion feels appropriate to her status. But the guard outside the mansion directs us to one of the academies in the same complex. Hediye Yusuf has her modest living quarters in one of the academies. We meet in her living room which is simply furnished with a television and padded cushions arranged on the ground around three walls. Her bedroom is a tiny affair, kitted out with a bed and a wardrobe. 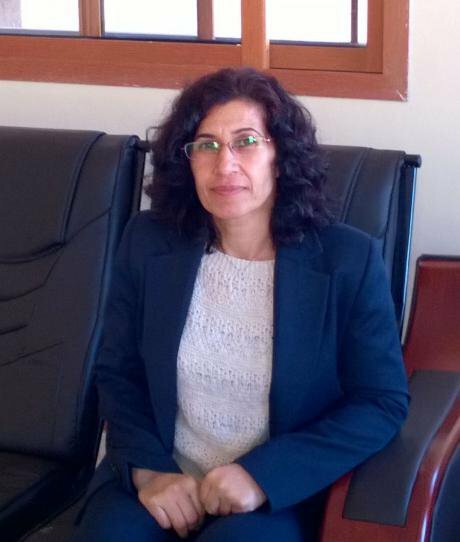 Hediye joined PKK at the age of 18 (now 43) in 1990 and made a conscious decision not to get married but to give her life up to the revolution. She was put into prison for two years, three months (solitary for three months in bad conditions) for her political activities. “This is the life of the revolutionary”, she says. When I ask isn’t it natural for people to want to be in relationships, she says, “the biggest revolution is the one that needs to take place inside”. I am intrigued by this emphasis on personal transformation, unusual for revolutionary movements who normally believe that a changed system will transform human character. When I return to London and plough through Öcalan’s vast oeuvre, I see that this is one of his sayings. People everywhere quote Öcalan, a kind of sloganizing, although heartfelt, rings alarm bells nonetheless. Yusuf is, however, frank about the difficulties of co-presidentship, especially when your peer is an unreconstructed male although she doesn’t say this in so many words. Shared leadership between men and women at every level is a cornerstone of this society. As co-president of Cizire canton, she shares her post with the Arab leader of the Shammar tribe, Hamidi Daham al-Hadi, who joked in 2014. ‘I didn’t ask to share power with a woman,’ he said, ‘They made me do it.’ Yusuf says that al-Hadi did not think she would be capable of fulfilling her responsibilities but after two years of working together, he has grudgingly come to accept her as an equal. She sees herself as more hard-working than him. I say that the compensation for working harder in shared jobs usually means more power derived from greater knowledge and familiarity with the work. She smiles mischievously. The academy of ‘Jineolojî’ is based in the same complex, an academic discipline which roughly translates as the sociology of women or the science of women (jin=woman), the Kurdish women’s unique take on feminism. It is ‘trying to overcome women’s non-existence in history… to establish a true interpretation of history by looking at the role of women and making women visible in history’ reports Janet Biehl, partner of Murray Bookchin whose ideas influenced Abdullah Öcalan, the guru of the Rojava revolution. Biehl quotes a tutor of Jineolojî who considers women to be ‘the main actor in economy, and economy as the main activity of women . . . Capitalist modernity defines economy as man’s primary responsibility. But we say this is not true, that always and everywhere women are the main actors in the economy.’ The entire population is encouraged to attend these academies to be educated in the philosophy driving the revolution. In his pamphlet on women’s revolution, Liberating Life, Öcalan argues that feminism can never be totally successful in a capitalist system, that class and race equality in a secular democratic system is part of the struggle for women’s liberation and that ‘a movement for woman’s freedom should strive for anti-hierarchical and non-statist political formations.’ Öcalan has given up on the nation state because he believes it is inherently patriarchal and anti-democratic. This is why some Kurds cannot fully sign up to the Rojava revolution because they are no longer demanding a greater Kurdistan. Nuvin, the woman who works at the media centre and acts as my interpreter for the first couple of days, is one of them. As a university student, she participated in the peaceful protests against Assad. She used to sneak away to Qamişlo, Rojava’s capital city, to give her family the slip, for variously themed protests every Friday: Freedom Friday; Free Children Friday; Day of Rage et cetera. When the protests became militarised and infiltrated by Christian and Muslim radicals, she left, disheartened. Some protesters joined the FSA (Free Syrian Army). Her motivation for joining the protests was the extensive history of Assad’s discrimination and criminalisation of Kurdish culture and identity. The Kurdish people have long seen themselves as ‘the largest nation without a state’ and some have yet to come to terms with the idea of self-governing autonomous regions remaining within the borders of Syria. Nuvin would like to see a greater Kurdistan uniting all the Kurdish areas in Iraq, Iran, Turkey and Syria. She is not dissuaded by the counter argument that the position of women in KRG, for example, is much worse than in Rojava. Daham, on the other hand, is content to remain within Syrian borders because he is surprisingly pro-Assad; when I point out Assad’s historical discrimination against the Kurds, he agrees but says that everything has a disadvantage and an advantage. Assad is not as bad as Saddam Hussain. There was free healthcare, education and welfare under him. I ask Daham why he doesn’t live in Assad’s Syria. He says he would be forced to serve in the military. He supports the revolution but intermittently refers to it as the crisis. Daham sees himself proudly as Kurdish and Syrian and simply wants more autonomy. There is also the question of money. Unlike his boss Karawan, Daham believes money is important; his salary barely covers the cost of his cigarettes. I ask if he minds that his 16 year old assistant earns as much as him. No, he says, he works very hard. Equality of income doesn’t bother Nuvin either but, like Daham, she feels the money is not enough. Nuvin gave up her hundred dollar job at a privately owned radio station for a salary of about $55 at the media centre because in this job she gets a chance to practice her English. The different commitments to the revolution are already apparent which gives rise to the big conundrum: how can one system satisfy the vast differences in human aspirations. And which aspirations will get priority? And if these aspirations are articulated through a genuinely democratic process, will everybody abide by it?